You are here: Interventional Radiology/P. David Sonntag, M.D. 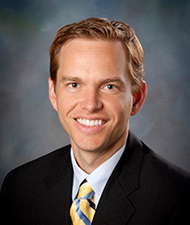 Dr. Sonntag complete his fellowship in Interventional Radiology at the University of Wisconsin in 2013 where he gained extensive experience in liver directed tumor therapy. At St. Luke’s he started a microwave ablation program for the treatment of liver, lung and kidney tumors. He is the primary investigator of the St. Luke’s Therasphere Y90 program for the treatment of patients with unresectable hepatocellular carcinoma. He has clinical interest in radial artery access for the treatment of malignant and benign masses including; chemoembolization, Y90, prostate artery embolization for BPH and uterine artery embolization for fibroids. Other interests include cirrhosis and portal hypertension, he performs TIPS and BRTO/PARTO procedures. When not working he enjoys spending time outdoors with his wife and five children.